The Sun Odyssey 36i, 3 cabin version, is the new high-performance cruising yacht built with comfort in mind and has been designed for those looking to relax and escape. Set apart from the competition by its modern lines, powerful sail plan and spacious interior, the meticulously designed hull delivers smooth performance under sail as well as power. Mounted on a sculpted steering pedestal, the large diameter leather wrapped wheel is responsive on all points of sail. 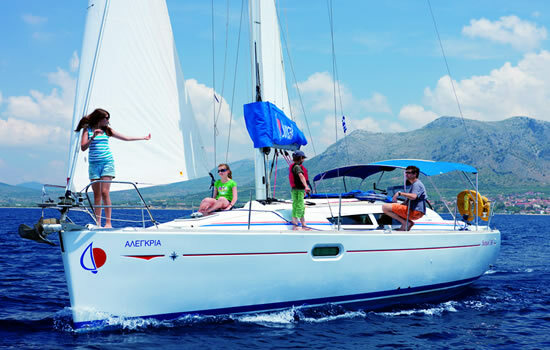 The Sun Odyssey 36i has been designed with two below deck layouts available, both using very high quality materials. Down below the light and airy interior has all the amenities of a large cruising yacht with the modern galley and sliding navigation station making it a joy to spend time onboard. All in all, this mid-sized yacht combines elegance with high performance and is an exceptional sailing boat, completely sea-worthy and finished with exceptional craftsmanship inside and out. Yacht charter with above mentioned equipment - Snorkeling Gear - Initial ice and water - Dinghy and outboard motor - Linens & Towels - Full Kitchenware.